Glock G17 coyote brown 9mm 19 round factory magazine, new. 4th generation magazine ..
Glock G17 9mm 17 round factory magazine gen 4, new. 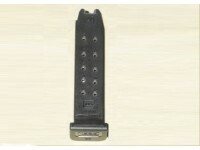 4th generation magazine has am..
Glock G17 9mm 17 round factory magazine gen 5, new. 5th generation magazine has am..
Glock 33 round 9mm factory gen 4 magazine. Brand new, may or may not come in box. ..
Glock 33 round 9mm factory magazine. Flat dark earth color, gen 5. Brand new, may or ..
Glock 33 round 9mm factory magazine. OD Green, gen 5. Brand new, may or may not come ..
KCI Korean 33 round magazine for Glock 9mm, new. Works with the model 17, 19, 26, 34 or othe..
Magpul Glock G17 9mm 17 round GL-9 P-Mag. ..
Magpul Glock G19 9mm 15 round GL9 P-Mag. ..
Magpul Glock G26 9mm 12 round GL9 P-Mag. 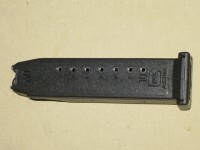 ..
Glock G20 10mm 15 round gen 4 factory magazine, new. It is 4th generation with ambi-cut. ..
Glock G21 .45ACP 13 round gen 4 factory magazine, new. ..
Glock G22 .40 S&W 15 round Gen 4 factory magazine, new. 4th generation mag with am..
Glock G22 .40S&W 22 round gen 4 factory magazine, new. Will work with the model 22, 23, or ot..
Glock G23 .40S&W 13 round factory magazine, new. 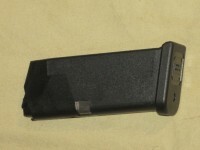 Will work with the model 23, 27, or other co..
Glock G26 9mm 10 round gen 4 factory magazine, new. ..
Glock G26 9mm 12 round gen 4 factory magazine (10rd +2 factory extension), new. ..
Glock 27 .40S&W 10 round gen 4 factory magazine (9rd + Glock factory extention), new. ..
Glock G27 .40S&W 9 round gen 4 factory magazine, new. These will work with all Glock 27 pisto..
Glock 33 .357 Sig 9 round gen 3 factory magazine, new. 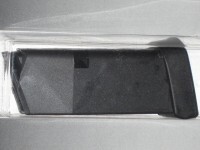 It will work with gen 1-3 Glock 33 ..
Glock G17 9mm 10 round gen 4 factory magazine, new. 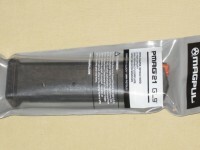 4th generation magazine with ambi-cut an..
Glock G17 9mm 10 round gen 5 factory magazine, new. May not come in package. 5th genera..
Glock G19 9mm 10 round gen 4 factory magazine, new. 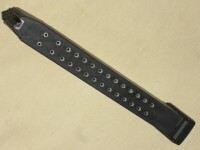 It is metal lined and will work wit..
Glock G19 9mm 10 round gen 5 factory magazine, new. May not come in package. 5th g..
Glock G19 9mm 15 round gen 5 factory magazine, new. May not come in package. 5th g..
Glock G20 10mm 10 round gen 4 factory magazine, new. 4th generation with ambi-cut. 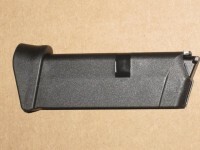 ..
Glock G21 .45ACP 10 round gen 4 factory magazine, new. ..
Glock G22 .40S&W 10 round gen 4 factory magazine, new. 4th generation mag that will..
Glock 23 .40S&W 10 round Gen 4 factory magazine, new. 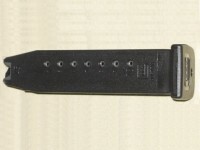 Will work with the model ..
Glock 29 10mm 10 round factory magazine, new. It is 4th generation with ambi-cut. ..
Glock G42 6 round .380 ACP factory magazine with extension, new. 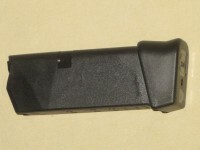 ..
Glock G42 .380 ACP 6 round factory magazine, new. 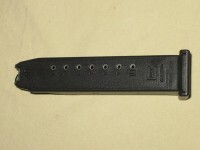 ..
Glock G43 6 round 9mm factory magazine, new. ..
Glock G43 6 round 9mm factory magazine with extension, new. ..
Korean KCI Glock G19 15 round 9mm magazine. It was made in Korea, is metal lined, and..
KCI Korean Glock 17 17 round 9mm magazine. Work with the model 17, 19, 26, 34 or other doubl..
New Korean KCI 26 round .45 ACP magazine for the Glock 21. 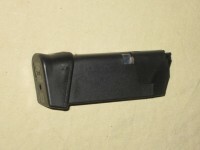 ..
KCI Korean 31 round magazine for Glock .40S&W, new. Works with the model 22, 23,&nb..
Magpul Glock G17 9mm 10 round GL-9 P-Mag. ..
Magpul Glock 9mm 21 round GL-9 P-Mag. ..
Magpul Glock 9mm 27 round GL-9 P-Mag. ..
ETS Glock 9mm translucent smoke 31 round magazine. 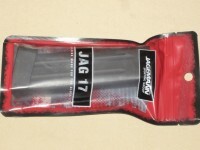 It will work in the Glock 17,..
ETS Glock 17 translucent smoke 9mm 17 round magazine. 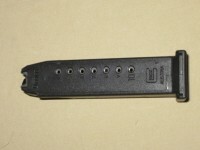 ..
ETS Glock G19 translucent 9mm 15 round magazine. ..
ETS Glock 9mm translucent smoke 22 round magazine. It will work in the Glock 17, Gloc..
ETS Glock G43 translucent 9mm 12 round magazine. ..
ETS Glock G43 translucent 9mm 7 round magazine. ..
Glock G30 10 round .45 ACP gen 4 factory magazine with extension, new. 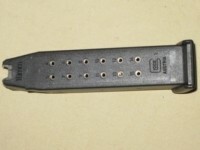 ..
Jagemann Glock G17 9mm 17 round magazine. ..
ETS Glock G42 translucent .380 ACP 7 round magazine. ..
ETS Glock G42 translucent .380 ACP 9 round magazine. ..
Used factory Glock 13 round 45ACP mag. Likely marked restricted for LEO. ..
Used factory Glock 13 round 40S&W mag, will work with the model 23, 27, or other ..
Korean 33 round magazine for Glock 9mm, new. Works with the model 17, 19, 26, 34 or other do..